Second Gear Club’s Rider Development Clinic will teach basic safety and motorcycle techniques. Students will experience hands-on training, verbal coaching and riding demonstrations on how to operate a dirt bike then perform exercises in a controlled environment. Class sizes are kept small to ensure that maximum attention is given to each rider on and off the course. The student ages range from 6 to 14 years old. 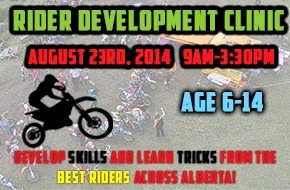 Let your kids learn from the pros, we’ll have lots of CMRC and CMA racers on site providing their expert instruction. Kids all ages must have parent/guardian stay onsite all day. Topics covered include going over safety procedures, explaining the order of the day, assigning groups, as well as introducing the coaching staff! All times are estimates and are given as a guide; achieving lesson objectives may require more or less time depending on class and riders skill level. Controls, Moving the motorcycle (clutch, starting, stopping), Riding Posture, Shifting, Lower Body Control, Turning, Line Selection, Counterbalancing, Riding Over Obstacles, Riding Responsibly, Basic Bike Maintenance. Parents/guardians will be involved in their children’s coaching process, come learn with them and most importantly…have fun! We realize that there are many kids starting out don’t have a full set of riding equipment just yet. We do not recommend riding without a full set of riding gear. However, at a minimum participants will be required to have a good quality helmet, goggles, knee pads, a pair of boots with stiff ankle support and of course a bike! It is highly recommended that riders invest in quality safety gear such as a helmet, boots, chest protector, neck collar/brace, goggles, and proper jersey/pants/gloves. Hotdogs, burgers and drinks will be provided at lunch from Spolumbo's Sausage! Don’t forget to pack your lawn chairs, snacks, drink & gas. While you don’t have to be a SGMC member to attend, it has its benefits! Registration is $40 per participant with a valid SGMC membership. The great part is that we’ve kept the cost low and have tried really hard to make family participation as inexpensive as possible. With an annual family membership of $30/family, you can attend all our great events and races! These will be available the day of the clinic. Turn right onto Township Rd 264. Continue 700 m, driveway is on the right and will be marked.